The census website crashed, and the Tweets were hilarious. Hear that sound? That's all of Australia collectively screaming. One day, one website, 17 million people. It’s happened. 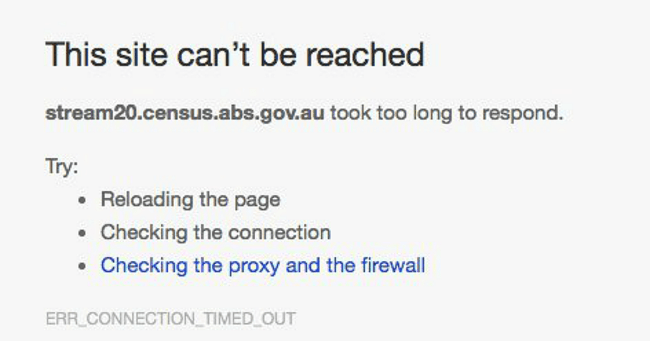 The census website is down on the one and only night it really needed to be… well, not down. Inevitably, Twitter is lighting up with pithy little expressions of frustration and “I told you so” triumph, collected under the hastag “censusfail”. Dear Mr ABS IT guy. Ps. No pressure but off to bed shortly. The #censusfail certainly doesn’t do much to assuage criticism about the vulnerability of private data, a high-profile concern that’s plagued the 2016 count. Of course, there were a few smug citizens who decided not to put it off until the last minute and are now laughing in our procrastinating faces.